Snake and camera work for sewer line maintenance is a common request we get from our customers because many of them keep track and remember when they should do it. But many unfortunately wait too long or completely forget. The result: a sewage and water back up which can lead to damage or a costly cleanup. If you have an older home, you’re likely to have an older sewage system. And those systems come with different backup causes. There are many different causes of sewer line back-up, but the most common ones are tree root invasion, grease, and pipe scale buildup. With tree roots, you’re looking at problems such as root growth into the pipes, causing holes/blockages or roots wrapping around the line and crushing it. In a sanitary sewer, this can create sewage backup into the home. Blockages in storm sewers can result in seepage and flooding during heavy rains. If you’re pouring grease down the drain, now is the perfect time to stop. While it’s liquid going down the drain, it does harden as it cools, and that creates grease buildup and a clog. Pipe scale buildup, on the other hand, is generally something that just happens with time. Debris slowly builds up, slowing the rate of flow, which leads to a clog. Of course, your cause is likely going to be based on what type of system you have. Homes built before the mid-1950s typically have these types of systems. Because the system was designed using multiple sections and joints, there are many places where tree roots can intrude to feed off of the water – this happens with both storm and sanitary lines. Without intervention, the roots will grow, causing debris flowing through the sewer line to build up and block anything else from passing. The blocked lines can result in the flooding of anything that goes down the drain. These lines should be snaked by a professional each year as they can use root-cutting equipment (Killeen uses cable machines with multi-sized heads) to trim-back the problem. We also use cameras to make sure all roots have been removed and that there is nothing else that could compromise the line. But unless the system has been repaired or completely replaced, the roots can eventually grow back, and the process starts all over again. Fiber conduit sewer lines started where clay left off and lasted through the 1960s. Often referred to as Orangeburg, this type of system is made of wood pulp and tar. While tree roots are rarely an issue, fiber conduit lines are often found in a deformed state over time. They begin to warp into an oval shape which affects sewage flow. 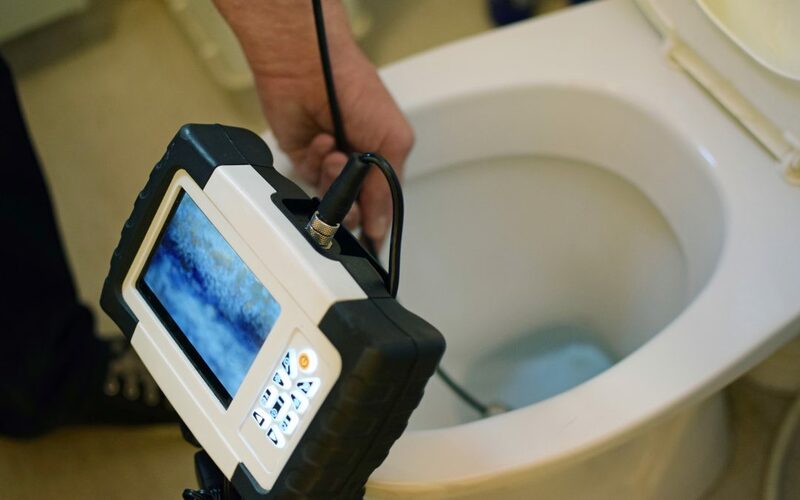 A professional can check the drain with a camera to confirm that your system is made of fiber conduit. If it is, they can safely clean the line using the right kind of method, which is recommended as yearly maintenance, depending on the deformation of the line. After the fiber conduit came the cast-iron systems, starting in the 1970s and pulling through to the present day. Unlike the clay and fiber conduit lines, heavyweight cast-iron has fewer joints, is exceedingly resilient, and is the leading choice of professionals. However, pipe scaling is an issue with this type of sewer line. As we mentioned in the previous section, deposits accrue on the inside walls of the pipe which will catch solids such a toilet paper to cause a blockage. A professional can clean the line with a high-pressure water jet to help break down the scaling. After that, you should have the system snaked once per year to stay on top of it. Like cast iron, this is a type of system that comes with most newer homes. PVC or ABS plastic piping is often preferred as it’s lightweight and inexpensive, yet durable. But they don’t last forever. Like the fiber conduit pipes, these can crack or warp with time. The best way to stop a backup? Regular maintenance before it happens. Put a screen over your bathtub drain to avoid hair clogs. Check the drains every few weeks for any hair that may have slipped through. Don’t push food down the sink, even if you have a garbage disposal. Scrape it into the trash before handwashing or putting dishes in the dishwasher. Never rinse grease down a drain. It may go down as a liquid, but it will quickly turn to a solid and clog the line. Do not flush wipes even if it says flushable. If you have hard water, install a water softener. This will help reduce the naturally occurring minerals from building up. Have a professional snake your drains 1-2 times every year to catch potential buildup or tree roots from doing too much damage. Be sure to have them do a video inspection at the same time to ensure all roots have been removed and that the line is in good condition. If you experience seepage or basement flooding, do not assume waterproofing is necessary. Root blockages in the downspouts or storm sewer can cause the same symptoms and often be remedied easily. Routine maintenance with video inspection is the best way to avoid ill-timed backups and flooding. It also reduces the time and cost required to clear a blockage. We cannot recommend maintenance checks and video inspections highly enough as something to do during a home inspection or the purchase process of a new home. It’s not something most people think of, but if there’s a compromise in the system which needs to be repaired, a professional plumbing company can provide proposals and an excavation crew to handle repairs quickly. Make sure to consult an industry professional like Killeen Plumbing who can talk with you about the best maintenance options for your system.